A major pothole on Ward Parkway and 72nd Street cost one driver $3,000 in car repairs. KANSAS CITY, Mo. — Driving on Kansas City streets is often like a dangerous game of dodgeball. Drivers trying to avoid potholes sometimes swerve into other lanes. But other times, they can't get out of the way in time. Dr. Mark McCune was driving Saturday night along Ward Parkway and 72nd Street. It was raining and dark. “All of a sudden we started hitting the severe potholes, a string of them. It seemed like five or six of them. And then it stopped for a minute and then we hit another major one,” McCune said. After hitting the pothole, his front tire had a 3-inch gaping hole in it. His back tire blew out. The vehicle's alignment is shot, and the wheels are bent. One pothole cost him $3,000 in repairs, he said. The pothole is so bad that people started talking about it on social media, and Kansas City street crews got the message. They say they have repaired it more than once, but the asphalt they poured into it didn’t stick. Rain and freezing temperatures loosen the asphalt, and as drivers hit the pothole, the asphalt becomes removed. “This is not about them not fixing the potholes timely, because there are just so many of them all across the city. It’s about the safety,” McCune said. McCune said he would like crews to set up a barricade blocking the massive pothole so that more drivers don't hit it and damage their cars. “That's not a usual thing that we do because again, the time that it takes to set up a barricade we would rather just go out there and patch it," Hernandez said. "That’s why we have been to that location already several times to patch. Unfortunately, as you’ve noticed, it keeps popping back out." Crews are expected to be in the area again this week. 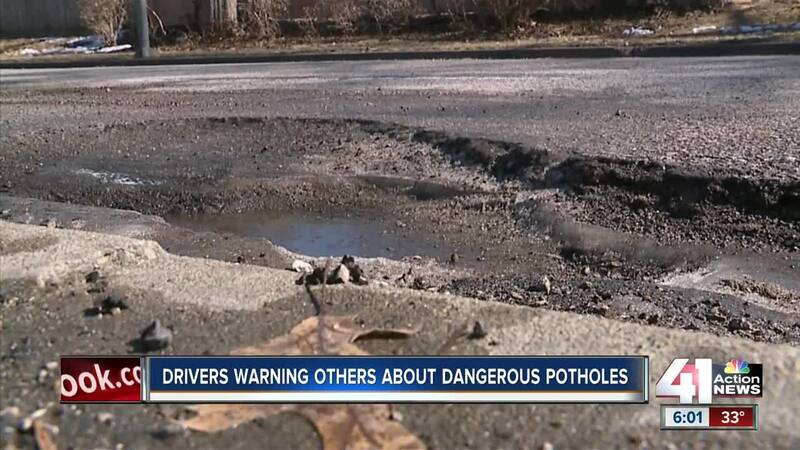 They will keep making temporary pothole repairs until the temperature hits at least 40 degrees, when it's warm enough for a more permanent solution. If you hit a pothole in Kansas City and your car is damaged, you can file a claim at KCMO.gov. Your claim will be investigated, and the city will determine whether you will be reimbursed.